(c) 2008 Frank Collins. If you wish to quote from this article please ask the author's permission. 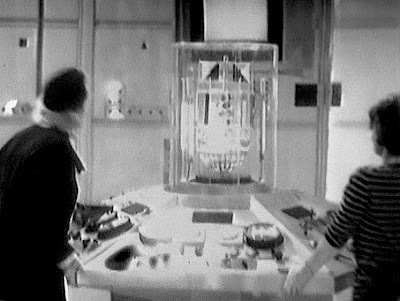 In both the Pilot and the transmitted version of episode one of An Unearthly Child we are introduced to the interior of the Doctor’s time and space machine, the TARDIS. 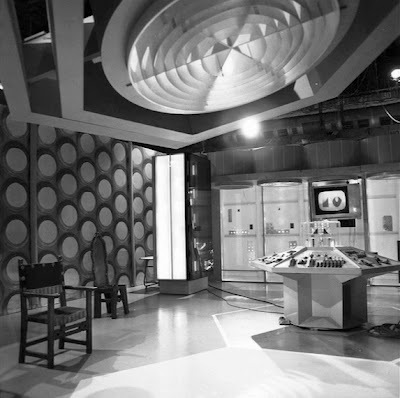 Brachacki’s designs for the TARDIS include both the iconic hexagonal control console with its array of switches and dials and the central rotor mechanism and the honeycomb, roundeled interior wall design. Both of these design features would go on to form a continuous, ever evolving visual thread throughout the series long run and these motifs are still in evidence in the new series that commenced production in 2005. In the transmitted episode, as opposed to the Pilot, we are also made more aware of the hexagonal motif on the floor of the TARDIS, the banks of machinery at one end and the huge hexagonal light suspended above the console area. These elements, from both versions of the first episode, more or less constitute our lasting visual impression of the interior of the TARDIS. Later in the series, other spaces and rooms are added to compliment these designs but were not produced by Brachacki. Brachacki’s visual stamp on the series, although only brief, was highly influential and has been long lasting. The roundeled walls, hive-like in nature, were clearly inspired by the ‘form follows function’ Bauhaus school of thought with their clean, crisp, geometric patterns that make simple but effective use of shape and mutual integrity. Another major influence on both the interior walls of the TARDIS and Ray Cusick’s Dalek designs should be noted. Buckminster Fuller’s use of the geodesic dome and his Dymaxion house concepts have some bearing here. Certainly the geometric patterning and structure of the geodesic dome is reflected in the honeycombed TARDIS walls and the mass-production kit method of house building he proposed suggest a construction brief that similarly places function at the centre of the TARDIS concept, especially for the console room, and later the super-forms of the Daleks. However, all of Brachacki’s work is based on the hard-edged shapes of the Bauhaus school whereas Cusick’s is firmly in the school of American designers who reacted against this. 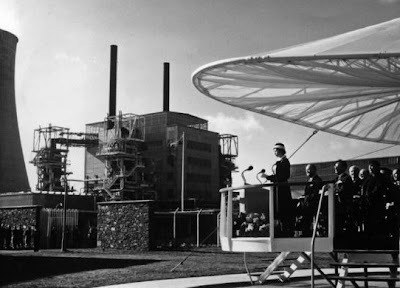 A further link back to Moholy-Nagy and the Russian constructivists is Russian architect Konstantin Melnikov. 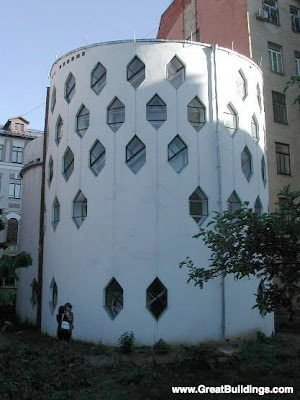 One of the best, existing examples of his work is the residence completed in 1929 in Moscow that “consists of two intersecting cylindrical towers decorated with a pattern of hexagonal windows”.6 This modernist structure is very TARDIS like in appearance and this is reflected in the geometry of Brachacki’s honeycomb walls and hexagonal shapes for the TARDIS interior. The geometric is further defined in the suspended lighting, the console and the floor all of which are of complimentary hexagonal shape. 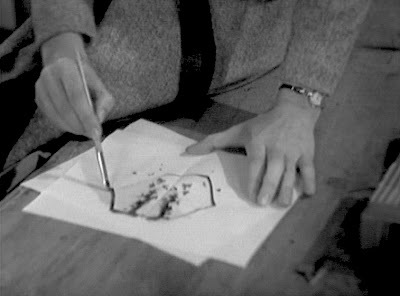 The obsession with the hexagon is also pre-empted in the Pilot episode by Susan’s brief reverie whilst she blots some paper with ink in the schoolroom. Not only does the Rorschach like blot she produces emulate the series own avant-garde title sequence with its scudding electronic clouds but she then roughly sketches a hexagon like shape over the top of it, hinting at the design of the console room before we even get to see it. The hexagon’s tessellating properties, as in the cells of a beehive honeycomb, make efficient use of space and building materials and this again reflects the integrity of the interior walls. The console itself is of great importance, especially the central column. 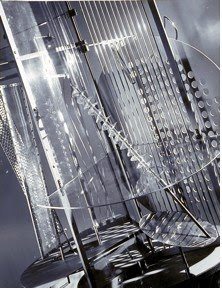 This clear column rises and falls whilst the TARDIS is in flight, the interior mechanism is a collection of geometric shapes, mobiles, lighting that turns, flashes and rises and falls at the same time. 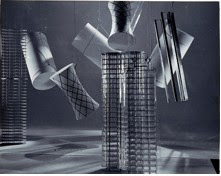 In visual terms it is clearly influenced by Moholy Nagy’s kinetic light sculptures, his set designs for Things To Come and his moody photographs of contemporary glassware. A major influence here is also likely to be his “Light Prop for an Electric Stage", a huge kinetic sculpture for the theatre composed of colour, light and movement: light as performance art. The light prop takes the form of a cubic box containing a glass and polished metal mechanism designed to stand alone on a darkened stage. The audience watches, through a porthole in the box, the machine's direct response to a two-minute illumination sequence created by 116 coloured light bulbs flashing on and off”.7 Sound familiar? So, Brachaki’s original design was powerful, modern and, ironically, timeless, seizing on those virtues that the modernist designers held above all else – a European based, almost avant-garde, higher order of form, function and composition that would transcend obsolete ornamentation. The sense of traditionalism being superseded by modernism in Britain in 1963 was no better expressed by having Barbara and Ian cross that threshold between the mundane, everyday exterior of the battered police box and Brachaki’s avant-garde, interior space of tomorrow. "...were clearly inspired by the ‘form follows function’ Bauhaus school of thought with their clean, crisp, geometric patterns that make simple but effective use of shape and mutual integrity." Nice idea, but not really. The design was based on the idea of circles being infinite, and so reflecting the infinite/eternity aspect of the TARDIS. And the tiered structure was based on a pill container of the time! I know this, because Peter Brachacki told me so! Also, the Pilot has more 'modern' switches, but these became more everyday in the remounted first episode. Brachacki didn't have anything to do with the controls on the console. These were left to the discretion of the people who built the console, being made from whatever was around. They certainly were not 'designed'. The original, but too expensive, ideas for the central column was for a 3-D 'map' showing the path of the TARDIS's journey, rather than what we ended up with, and the controls were meant to be moulded to only fit the Doctor's hands. Thanks for your very informative comment. Well, I bow to your superior authority, naturally. You asked the man himself! Cor! This was just my interpretation of the design as it stands in relation to the major design movements pre and post war. I had no real idea of the exact inspirations of the TARDIS design and was just extrapolating from my own knowledge of design history as to what I thought might have informed the design. In the end, did you enjoy the article? That's all that matters to me! I really enjoyed this article and it made me see the Tardis design as if for the first time. I love the connections made with the wider world of design history. Took me back to my art college lecture hall. I also like JV-R's additional insight into the infinite nature of the circles! Tardis-wise, I have always wondered if something being bigger inside than on the outside is the one true original idea in Dr Who.